Our step and repeat backdrops are a great option for providing a custom and fun addition to your event. We offer digital files (you print) in ANY SIZE you need or select a printed option from the dropdown menu. Choose from one of our standard backdrops or create your own (Just $10 extra) ! We Add your wording, picture or colors for birthdays, baptism, showers, weddings and other special occasions or your logo for corporate events or fashion shows. They can also be used as an important element of any dessert table or Photo Booth Decor, they are great Photo Props, because it really sets the tone for your theme. 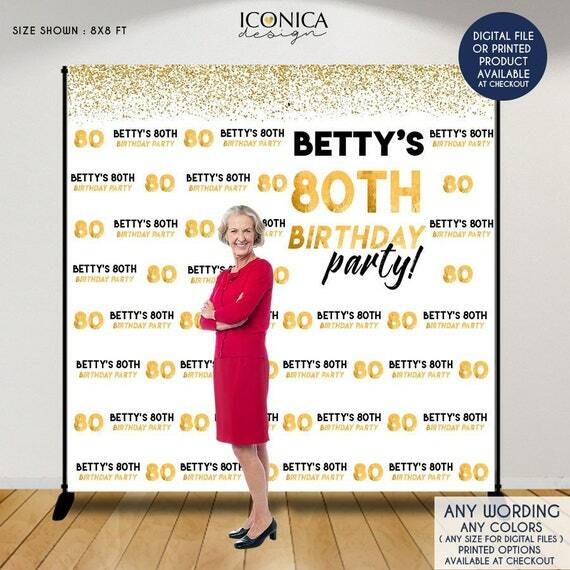 This listing is for a "Birthday Party Backdrop" any age. Colors are customizable by us! Select DIGITAL or PRINTED OPTION from the dropdown menu at checkout. Please note that this is just a graphic representation of GLITTER / FOIL. The product will NOT include actual glitter/foil, instead it will have a high resolution graphic that will print to look like glitter / foil . We would recommend professional printing or using a high quality laser printer to make our customers achieve the best results if they decide to print the files at home. - DIGITAL FILE ONLY: A PDF or JPG file sent to your email. No physical items will shipped on this option. Printing will be needed on your own or locally. Please type in "notes to seller" box or via Etsy message the size you'd like for your file and wording. The 48x36" printed banner is printed on "Paper" ( it is the only option we offer in printed paper, no hangers included). - US standard shipping included, except Hawaii and Alaska (additional fees may apply) . IF YOU CHOOSE ANY OF THE "EXPEDITED" PRINTED OPTIONS, THE TURNAROUND TIME WILL BE 4-5 BUSINESS DAYS (Monday-Friday). Command Brand works best as they will not damage your wall and are durable enough to hand your backdrop. For Digital orders: 2-3 business days, or 24 HRS option available (Monday to Friday). Please select the option of your preference. For Printed orders: 5-9 Business Days. All the printed orders must be approved before printing. Delays on the approval of proof file will delay the turnaround time. 1. Purchase the item and complete. Please specify all wording and details you would like for your purchase. - Party Phrase or quote e.g "Happy Birthday", "Dreams come true" , "Emily's Pumpkin Patch", "Santa's Workshop"
Please be aware of the proof files we send via Etsy convo, if we do not get a response regarding the approval of the product, we will send an email to your registered etsy email account. *Please approve your proof or resubmitt your order with specific changes as soon as possible after receiving it or this will delay the process. If your event date is close, please keep an eye for the proof, otherwise Delivery upgrade will be needed for purchase (Digital File/Proof cost will not be refunded). Your backdrop will not be printed until you are happy with your design. We won't print without approval. Once you approve the proof, we will send the final product. If we don't receive an approval via Etsy message or email within 3 business days, we will send the high resolution file to your registered Etsy email. A digital file (.PDF or .JPG) high quality for printing will be sent to the email registered on your order within 2-3 business days from your purchase, Monday to Friday, if the proof file has been approved. If you need it sooner, message us via Etsy conversation! Rush Orders available. (24HRS Option Available).